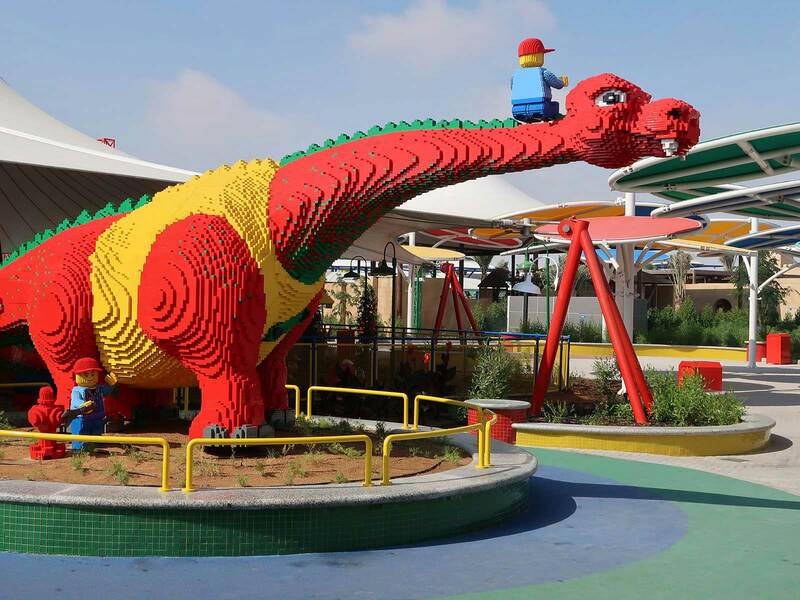 Legoland Dubai was in the first completed section of the Dubai Parks & Resorts complex. 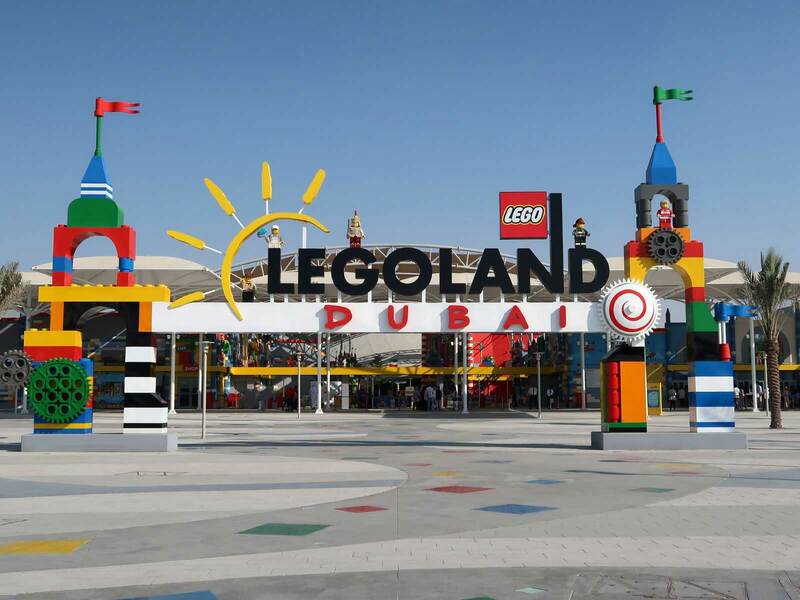 It opened to the public on October 31st last, some two days after a final inspection by His Highness Sheikh Mohammed bin Rashid Al Maktoum. It is a bright and colourful place, though those who have been to the other six parks in the chain will find it quite small; we were ready to leave in a little less than two hours despite exploring at a relaxed pace. Enthusiasts should be aware that all the attractions in the park are copies of those elsewhere, and the selection doesn't include any of the range geared at older visitors (such as Ninjago the Ride, Project X, Power Builder, and Polar X-plorer). The Submarine Adventure ride was still under construction during our visit, though it may well be open by the time these words are read. We began our day with Dragon's Apprentice, a Zamperla-built family coaster. In the Malaysia park the designers elected to go with Zierer for both of their signature coasters, and I asked one of my contacts why that hadn't been done here. The reason turned out to be the minimum height restrictions; the Zamperla restraint was designed to support a minimum of 105cm, some fifteen centimetres less than that of the competing Zierer product. We were told that the ride at Malaysia was a mistake, and while I think that's overly harsh I'm a middle-aged coaster enthusiast rather than a four year old crying over the fact that I'm a few centimetres too short to ride my first roller coaster. The hardware is a revised version of the not-terribly-venerable 80STD design, re-engineered last year to comply with new European standards. The most visible difference from the perspective of the enthusiast is the removal of the pain airtime hump towards the end of the layout, though the trains have also been redesigned to provide a more comfortable ride. We immediately noticed that there was enough space for two of us to sit in the same car, a nice upgrade from the older units, though the operators asked us to take different cars for weight and balance reasons. Both of my rides were in the front seat, and from that location the ride was respectable enough; though the tracking wasn't perfect it was nevertheless noticeably better than the norm. Our second stop was at the Dragon, a Zierer Force Five with a section of dark ride at the beginning. The queue was built into a castle structure that at first glance looked to be the same as the one at Legoland Malaysia, but as we walked through glass doors at the entrance we realised that the entire courtyard had been enclosed, with the temperature held at a very respectable twenty degrees celsius through the magic of air conditioning. It felt really good to step inside, and it would probably feel even better during the summer months. We took our time walking through the queue towards the ride boarding platform. We ended up in the back car for our first lap, and that location allowed us to fully appreciate the merits of a top notch design. When I wrote about the Malaysian version of the layout last year I said that it "felt like any other large format family coaster", but in hindsight I think that was unfair of me; the reality is that this design has several thrilling moments that the rear seats serve to amplify. The initial drop, enclosed within the dark ride section, is case in point, as those unfamiliar with the layout will find themselves unceremoniously dropped perhaps twenty feet in a thoroughly dramatic manner. The main part of the ride is forceful yet smooth, delivering a memorable experience that we just had to do a second time. I was somewhat less impressed with the Lego Studios 4D movie, not least because a significant number of seats were blocked off with out of order signs, an embarrassing situation for a park that has been open less than three months. The film that we saw was an argy-bargy over the Book of Creativity, claimed to be the most powerful and dangerous magic book yet (though as a Terry Pratchett fan I rather suspect that the Necrotelicomnicon holds that title still). The only memorable aspect of the performance for me was the occasional appearance of a sickly looking character that vomited up maroon Lego pieces which assembled themselves into an impressive-looking dragon, albeit not of the roller coaster variety. The park has its own version of the Lost Kingdom Adventure target shooter built onto an Omnimover-style system, albeit one where every second base element has been left empty. One presumes that the system was deployed this way to minimise costs while also allowing for an increase in capacity in the future if required. The ride has four different colour targets, of which blue is worth the most at five hundred points. I concentrated all my effort on those, and for once in my life I beat Megan who had tuned out while the operator was telling us what to do. With that done we concluded our visit with Miniland, an impressive collection of model buildings that thankfully was both enclosed and air conditioned. There was a definite emphasis on the local in the selection, which included a replica of the centre of Dubai, part of terminal three at the airport, the Sheikh Zayed Grand Mosque, and the Burj Khalifa. Other featured attractions included the Hanging Gardens of Babylon, the Kuwait Towers, Petra, the Pyramids, and the Taj Mahal. 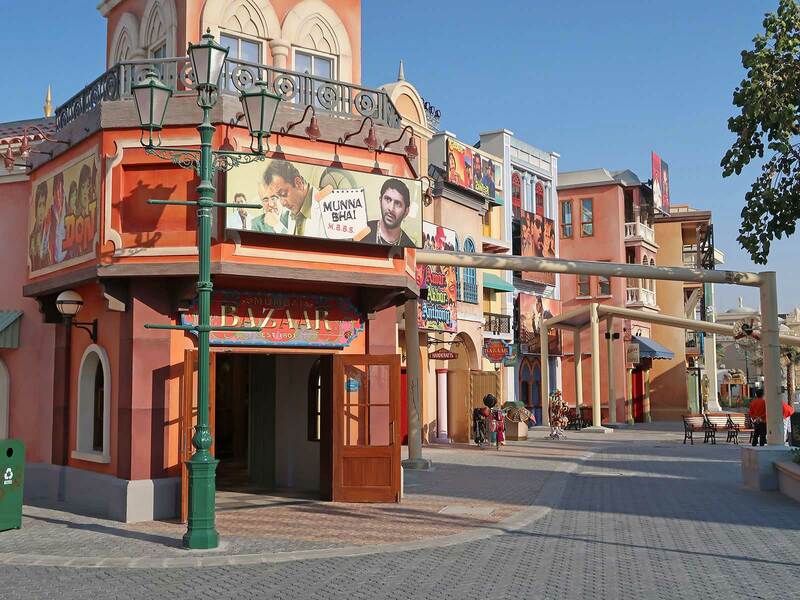 It was tempting to make gratuitous and entirely incorrect use of plurals when writing my trip report for Bollywood Parks Dubai, but after some consideration I decided that the subtlety would likely be lost on the majority of my readers. Instead, therefore, I'd like to begin this report by saying that the "Parks" is the first facility of its type anywhere in the world to be dedicated to the magic and intrigue of Indian film. While the place has no roller coasters (for now at least) it is still well worth exploring thanks to a selection of really interesting attractions. We spent almost four hours working our way around, and we could easily have spent longer. The most impressive from a technological standpoint was Krrish: Hero's Flight, a new generation flying theatre attraction from Canadian company Dynamic Structures. The queue was relatively spartan, especially in comparison to the elaborate waiting areas in Motiongate next door, but we did spot some framed hardware blueprints on the wall that revealed a thirty-six seat assembly with a lot more mechanical equipment than I'd have expected. The reasoning for it became apparent early into the show as the camera passed across a cable car in time to see a cable snap; without warning the entire theatre descended about ten feet in the space of two seconds, a far more dramatic motion than anything experienced on similar rides elsewhere. The film itself was ridiculously hokey, and while I'm not going to give a play-by-play it was laced with hero talk, culminating in a "let's finish this" (what else) from Krrish himself. The ride shares a building with RA.One: Unleashed, a superb video game themed 4D movie that is probably best described as a mashup between Scott Pilgrim vs The World and TRON. Against all expectation the pre-show was actually worth watching, as a cast member delivered a sales pitch for a new type of game controller embedded in a glove. While the presentation was underway a clever visual effect allowed him to disappear inside a suit of robot armour, subsequently emerging a few minutes later to direct us into the main theatre. Once we were seated the show began with the technology going wrong in spectacular fashion, though as always good triumphed over evil in the end. Our third stop was at Dabangg: Stunt Spectacular, a show that I'd been led to believe was one of the highlights of the park. Unfortunately the volume was set sufficiently high that I ended up spending a good chunk of the performance researching local noise regulations on my mobile phone. The level felt even louder than the show I'd complained about at Motiongate, leading us to rebrand it as Da Bang: Out your eardrums. Noise aside, however, the performance was forgettable, with the "stunts" consisting largely of cartwheels, occasional jumps, and a zipline or two from the rafters. When it came to an end we left with throbbing heads and a realisation that we'd lost almost half an hour of our lives that we were never going to get back. 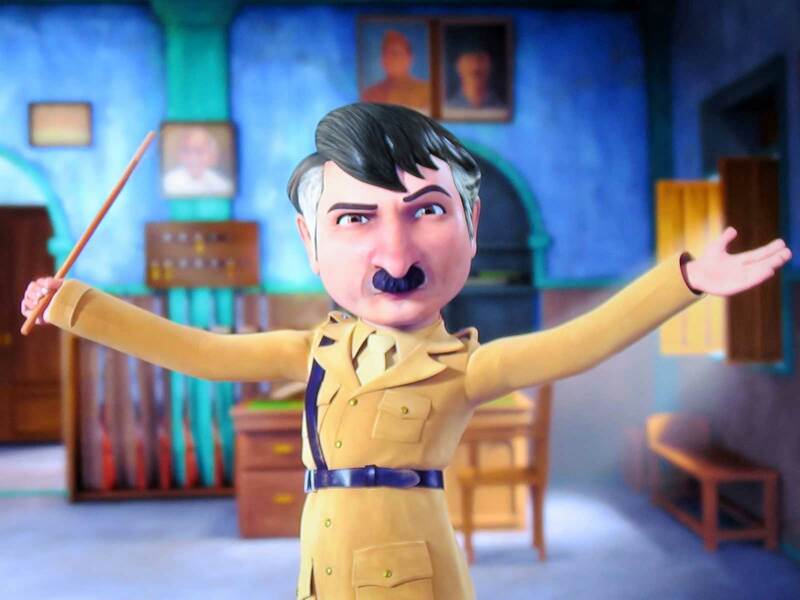 We were rather more taken by Sholay: The Hunt for Gabbar Singh, a target shooting ride with video screens that Megan decided to call the Mischievous Hitler ride after one of the characters in the pre-show, who bore more than a passing resemblance to the Nazi leader. The ride began with a forest scene where points were awarded for shooting fruit out of the trees as well as the occasional item thrown by one of the on-screen characters. From there we were moved to a campground scene complete with old-style Ferris wheel and cartoon enemies shooting in our general direction. Much of the rest involved characters on horseback chasing a train in footage that could have come directly from any movie set in the old west. Our next stop was at Lagaan: Thrill of Victory, a simulator with four separate fifteen-seat motion base units in front of a cinema screen. The show followed the path of a cricket ball as it bounced around an amusement park that featured, among other things, an enormous wooden coaster. There were some definite questions on continuity (and the laws of physics) but for the most part it was fun to watch, and the concept was certainly interesting. The only caveat I'd throw out there is that some of the motions were quite jerky, perhaps trying a little too hard to match with the action on screen. The final attraction for us today was Cinemagic, an interactive show where the audience was invited to help remake the trailer for the Bollywood hit Zindagi Na Milegi Dobara, a story about three friends who decide to turn their fantasy vacation into reality (and thus a story that should resonate for coaster enthusiasts worldwide). Practically all of those present were given the opportunity to take part, filming individual portions of the show in front of a green screen while someone backstage spliced the clips into the actual trailer. I chose to sit out, but Megan really got into the spirit of things, waving and cheering enthusiastically as the camera pointed in her direction. Aside from the stunt show my overall impression of the park was overwhelmingly positive, to the point that it was probably my favourite of the three at Dubai Parks & Resorts. It was full of colour and life, and there were things happening everywhere. Having said that, it would be remiss of me not to note that there really is no signature ride at the moment; though the upcoming Don: The Chase will certainly help I'd argue that more is needed. One obvious addition that occurred to me was to install dodgems themed as auto rickshaws, though I'm sure there are other good theming opportunities out there.